A lot of details can go into planning a Lake Tahoe, California wedding. Start here and find local wedding planners, great venues, professional photographers, caterers and bakers, and much more. Offering personalized and unique wedding experiences, A Beautiful Tahoe Wedding is sure to make your special day even more amazing. A full-service Tahoe wedding venue with elegance, intimate indoor or unique outdoor settings; customized to meet expectations perfectly. On-site, same-day licensing available. Romantic packages for a unique wedding with tours available. Professional photography and beautiful backgrounds in northern Nevada. Come to Alexanders Catering for your next big feast. No group is too small and we handle everything to make your event an enjoyable one. Leave the driving to us - charters and shuttles Reno, Sacramento and Tahoe. Corporate trips, ski shuttles, weddings and more. Anne Roos has provided a uniquely beautiful flavor to thousands of weddings and celebrations. Reno's most exciting resort hotel & casino, offering a variety of vacation packages for all seasons. Golf, ski, air races, entertainment & more. Experience the joy of soaring through the sky in a hot air balloon! Offering year round private cozy rides overlooking the beautiful Nevada valley. Thoughts Buffalo Mozzerella Sandwiches, and Sweet potato fries make tummies rumble. Offering catering and a banquet facility. Nightly dinner special and live entertainment. Enjoy the romance and nostalgia of a ride in a handmade carriage or sleigh. Ideal for weddings or adding something special to your Tahoe vacation. Offering a unique variety of Lake Tahoe rentals including deluxe cabins to elegant homes and condos. The best that Tahoe has to offer. Have the wedding of your dreams at the place of your dreams. Helpful guidance, packages, and budget friendly choices. Charming rooms, a cottage suite or garden studio - all set within a small paradise. Boat on the pond, pan for gold, or just simply luxuriate. The Edgewood-Tahoe golf course is a breath taking experience for your golfing and dining pleasure as it runs along the majestic Lake Tahoe shoreline. The Edgewood attracts mainstream celebrities among from people of all walks of life. Featuring elegant wedding cakes, first class menus and personal service, Elegant Affair Catering strives to make every event, an affair to remember. Romantic theme rooms. A fantasy vacation at Lake Tahoe. Special recreation, lodging, wedding and honeymoon packages. Beautifully decorated with special amenities. At Flour Girl Wedding Cakes every variety of cake for that special occasion is available! See an online menu and prices and reserve today! Ride in style for that special event in your life! Perfect for weddings, birthdays and tours with well maintained carriages and beautifully groomed horses. 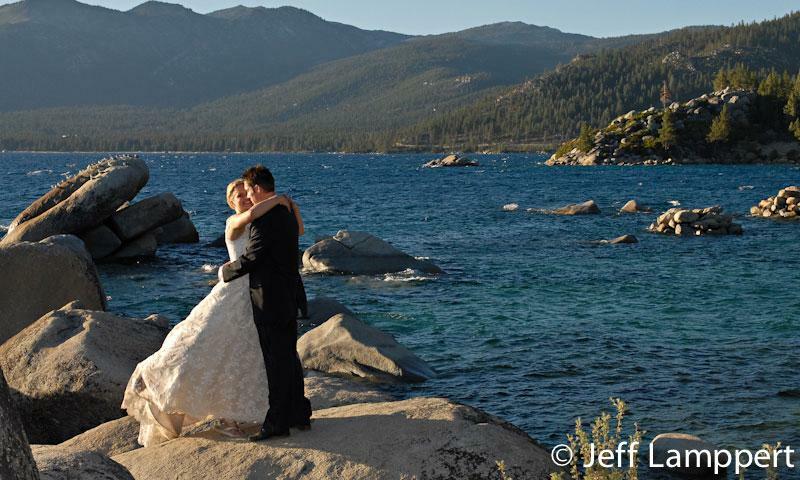 Celebrate your magical moment in spectacular Lake Tahoe. A scenic alpine setting for an unforgettable wedding with all the details taken out of your hands! A Grand Sierra vacation provides endless options in dining, bars/lounges, night entertainment/gambling, and family activities. Plan your next meeting or convention at Grand Sierra. This alpine paradise in the Sierra Nevada Mountains offers guests a private beach, 24-hour casino and numerous local attractions. Lake Tahoe could never be better. From the smallest of birthday confections to elegant multi-layer wedding cakes. Enjoy cakes that taste as good as they look. Premium chauffeur services for all of your personal events. From limousines, sightseeing tours & special occasions at a price you can afford. Lake Tahoe Wedding Ministries and Services would be pleased to assist with your wedding plans. Providing wedding services for 25 years at Lake Tahoe. Enjoy Lake Tahoe's party boat. This 52' yacht is ideal for any special event from corporate events to weddings. On board catering available. Located along the edge of Lake Tahoe in the backdrop of Sierra-Nevada Mountains. Artisan decor, Garden Terrace Chapel, Crystal Room Chapel for weddings & receptions. Luxuriate on the shore of Lake Tahoe. Beautiful condos with hotel-style amenities. Private beach, pier and boat moorings, fitness facility, complimentary shuttle. Mountain Magic Catering is able to customize to suit your appetite and needs and provides top drawer service and food for any event. Featuring a private beach, spa tub and personal concierge services, are just a few reasons why you will call Mourelatos Lakeshore Resort, your vacation home. All-inclusive packages for the perfect wedding in Lake Tahoe that dreams are made of. Cakes, churches, pictures, are a few of the amenities offered. If your next event needs to be a special one, North Shore Entertainment can provide the mood and music for any occasion. Vacation rentals, cabins and condos. From economy to luxury lodging - we have a wide selection to make your stay the best stay in Tahoe. A luxurious but intimate inn in North Lake Tahoe, a mountain escape with slopeside access. Well-appointed rooms and suites, in-room movie system, minibar, bath amenities. A top pick for ski-in, ski-out condo rentals at Lake Tahoe. A rustic lodge providing outstanding amenities, including fitness room, sauna, BBQs and much more. Plan the perfect wedding with Sierra Weddings! Enjoy a fantastic atmosphere, whether sunny or snowing, and gain beautiful photographs! Stroll back in time to this old hotel that offers 28 beautifully restored room. Located in the center of Virginia City. Ghost hunting, dining, weddings. Snuggle into a cozy cottage, log cabin or vacation home near Lake Tahoe. Beautiful forest setting. Tons of activities right outside your front door. Find the perfect vacation home, chalet or cabin near Heavenly Resort and Lake Tahoe attractions. Family owned and operated with lots of Tahoe suggestions. Ski resort with a variety of outdoor activities: biking, golfing, skating, and hiking. Great restaurants on location, with affordable packages for any occasion. Savor the panoramic views from your beautifully decorated guestroom at this mountain retreat. Rejuvenate in the hot tub, dip in the pool. Abundant outdoor recreation. The ultimate luxury in a western shore Lake Tahoe resort. After a long day of adventures, return to your spacious and beautiful suite or guestroom. Reasonably priced rooms and suites that make it a pleasure to come "home" after an adventure-filled day. Oversized vehicle parking. Outdoor spa and swimming pool. Experience the boating pleasure of Lake Tahoe with a yacht or sailboat cruise. offering private charters, public cruises, and wedding service. Your accommodation station - choose form a wide variety of lodging options in Lake Tahoe to find the right fit for you. Offering year round lodging properties since 1976. Fully furnished lodging options form home to condos, cabin, cottages and chalets. We have vacation specialists ready to help you find your perfect stay in Tahoe. Affordable boat and jet ski rentals. Enjoy Tahoe the way it was meant to be. Get away from the crowds. Experience the quiet west shore of Lake Tahoe and all the outdoor recreation available. Uniquely decorated mountain cabins. The perfect tux and the perfect fit for an unforgettable occasion. Trendy or traditional - Top-name designers & rental packages to suit any budget. Summer sightseeing; the charm of a steamboat, the wonders of Tahoe, outstanding cuisine for any special occasion rentals-- or embark on a regular daily cruise! Experience the wedding of your dreams! Located inside the elegant Harvey Resort hotel. Boasts 18-foot windows of breathtaking view. Impeccable, highly experienced staff. We offer several different beautiful locations to choose from to hold your wedding and reception! We take care of the catering too! Walk the isle in the heart of Reno, NV, with wedding options to suit your style. Casual to elaborate ceremonies, receptions, catering, planning. Founded in 1986, Wolf Lakes Park is just east of Clovis, a beautiful setting perfect for any wedding, reunion, or retirement party. Relax in Lake Tahoe's pristine beauty, enjoy the private beach. Cozy cabins, comfortable lodge rooms and RV Park and campground. Outstanding amenities. The South Lake Tahoe Wedding and Honeymoon Association provides information to people wishing to plan a wedding in Lake Tahoe Basin.